What’s Next for the German Left? The German left must figure out how to create an appealing socialist project among the “winners” of Europe’s crisis. The Eurozone crisis has set even the rigid German political landscape in flux. Merkel’s seemingly post-political governance, with what from many a German’s perspective appears as benign paternal strictness towards the continent, has attracted voters with its siren call of stability and morality. Paradoxically, this has come at the expense of both the Social Democrats and the neoliberal FDP, which is in death throes. As Wolfgang Streeck argues, the coalition of the SPD and the CDU may best be understood today as two faces of one larger Volkspartei representing Germany writ large. Germany especially is big enough, and its position in Europe comfortable enough, for its European policy to rest on the stereotype of free-riding southern Europeans profiting at the expense of virtuous, hard-working Northerners, whose interests only Germany can protect. It falls to the Left in Germany, which has made fairly little progress on domestic and European issues in the crisis, to break through this narrative. One positive signal in terms of greater pan-European solidarity was Die Linke party co-leader Bernd Riexinger’s trip to Athens, simultaneously with Merkel in 2012, which saw him protesting side-by-side with Tsipras. This, however, earned Die Linke near-universal disapproval among German voters. Die Linke is the only party of relevance to the left of the SPD. In comparison, the rapid rise and disappearance of the Piratenpartei (“Pirate Party”) stands out as a recent blip. 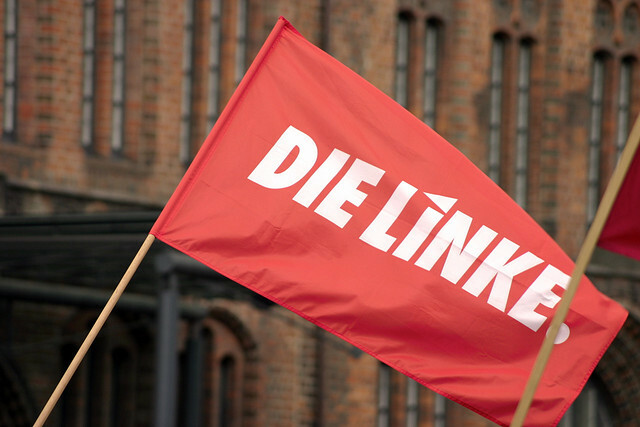 For Die Linke, the past few years have been a time of consolidation and transition, securing its hold in several state parliaments and slowly expanding outside its traditional voter base in the old East. But the party remains marginal in German parliamentary politics (particularly now as part of the smallest opposition in recent history) and is internally divided along a number of fault lines which often correlate with the rift between East and West. Die Linke was patched together in 2007 from the Party for Democratic Socialism (which emerged from the ruins of the East German socialist party) and the WASG, largely a West-German breakaway of disaffected social democrats and trade unionists. Despite the almost complete change of personnel and its ongoing critical reappraisal of the GDR, the party’s partial origins in the East German state still make it unpalatable as a coalition partner for many in the political establishment. The East-West fusion brought together political leaders with very different histories: Gregor Gysi, who was legal counsel for many GDR dissidents, and is the party’s leading intellectual; and the more populist West German Oskar Lafontaine. It also brought together fundamentally different voter bases. Among the party’s current leading lights are Katja Kipping, who represents the more libertarian-socialist stream (Emanzipatorische Linke), and Sahra Wagenknecht of the more traditional Kommunistische Plattform, who effectively acts as the party’s mediagenic spokesperson. Die Linke’s East German voters often combine nostalgia for the GDR and its welfare state with a heavy dose of political pragmatism. West German supporters tend to include disaffected unionists as well as principle-driven leftist radicals among their ranks. Western cadres often resent the East’s pragmatism and relative conservatism, which has included facilitating austerity measures when governing regionally (for instance in Berlin), while the East often resents the West’s perceived radicalism, sectarianism, and aversion to governing. Die Linke’s stance on Europe and its current impasse has not been as outspoken and clear as the broader European left may hope for. Officially, Die Linke advocates Eurobonds, an expansionary German fiscal policy, and a deep democratization of Europe’s institutions against the Troika’s diktat. But in practice, the German median voter is hardly easy game on these issues, so that in effect the party’s most relevant (yet insufficient) demand could be its more forcefully-pursued minimum wage of ten Euros. The fundamental problem of the German left remains the undeniable difficulty of formulating a salable leftist project among the winners of Europe’s crisis. No matter how asinine, the New Right’s myth of the Euro disempowering Germany has gained the upper hand in the battle for interpretational hegemony. For the first time since the immediate post-war era, a considerable parliamentary force to the right of the CDU is emerging: the ordoliberal, D-Mark nostalgic, socially reactionary Alternative für Deutschland. Bringing together sections of the old conservative establishment with parts of the New Right, it barely missed the 5% mark in last year’s national election, and recently bagged 7% of votes for the EU Parliament, where the AfD will be joining a parliamentary group of eurosceptics. The left wing of Die Linke, and particularly the autonomous left beyond it, also remains haunted by another deep schism which dates back to 1989. The fall of the Berlin Wall, in the estimation of many on the radical left, was an instance of history repeating itself, as the German state once again expanded eastward. While hailed abroad as a peaceful revolution, the “reunification” of FRG and GDR in fact went forth on the back of a disturbing nationalist current (“Wir sind ein Volk”) which found its most violent expressions in a string of xenophobic attacks across the country, including the notorious multi-day pogrom in Rostock (in which miraculously nobody was killed). Reacting to this new Germany, large fractions of the antifascist and autonomous movements adopted a more decidedly anti-nationalist stance, bringing forth a distinct “anti-German” (antideutsch) current which questioned and challenged various accepted tenets of the traditional “anti-imperialist” German left. In essence, the antideutsche rejected categorical pacifism. They disavowed solidarity with Palestinian and Arab nationalist causes, adopting a Shoah-informed, pro-Israeli position instead. The anti-Germans vehemently denounced anti-Americanism and anti-Semitism among the Left. They praised “Western values” over what they saw as sympathies among the Left with global Islamist reaction. And they promoted an unabashed hedonism over Greens’ and others’ praise of economic restraint. (A somewhat similar but smaller split found its expression in Britain with the 2006 Euston Manifesto). Not only do both camps invest energy in gaining the high ground over symbolic issues with little immediate practical salience in Europe (e.g. Israel/Palestine), but the division also has informed divergent explanations for and policies of resistance against European crisis management. To simplify and (somewhat) caricature: one side understands the Euro crisis as a conspiracy of transnational financial capital against labor and sovereign nations; the other smells anti-Semitic conspiracy theories in any hint at the power of financial capital. Looking forwards, the activities of some autonomous-communist networks such as “Ums Ganze” indicate a move beyond the divide. The “Interventionistische Linke” network is another non-parliamentary force working to merge anti-capitalist ideology with actively throwing a wrench into the German-European crisis machinery, in part by seeking to push Die Linke in a more decidedly anti-capitalist direction. The M31 and Blockupy protests in 2012 and 2013 illustrated the promise of a more active and coherent anti-austerity movement from within the radical left in Germany. All of this remains fairly low-key. But the upcoming protests and blockades against the inauguration of the new ECB headquarters in Frankfurt in fall 2014 could prove a good test for the German left’s capacity to effectively mobilize for pan-European political-economic and social change. Republished from Current Moment . Phil Mader is a researcher in sociology at the Universal of Basel.